Gathering my ingredients a few days before, I bought a small bottle of "pink wine cooler" in place of a bottle of red wine. I couldn't find a cheap bottle of red wine in the supermarket. I thought they were more or less the same. Please don't laugh. The big day arrived and I worked in the kitchen, with my Mom & siblings hovering around me. I read the instructions so many times that I felt like I could go through it during my sleep. The first thing I had to do was to cover the meat with flour and in the recipe, it was written to shake the meat in a ziplock with the flour, salt & pepper. I didn't have a ziplock so I used a big plastic bag that was so big that I lost the grip and the flour exploded on my face. My siblings still laugh at the memory of my whitened face. Dinner came. I got forced grunts of "Wow!" and "Delicious!". I thought it was terrible. It's a good thing my Mom "happened to have" another full dinner in the fridge that she reheated. Everyone wanted it, even me. I didn't try cooking again after that. Never. Until I moved to Italy did family obligation made me pick up the pots and pans again. At least I already knew the difference between a pink wine cooler and red wine. 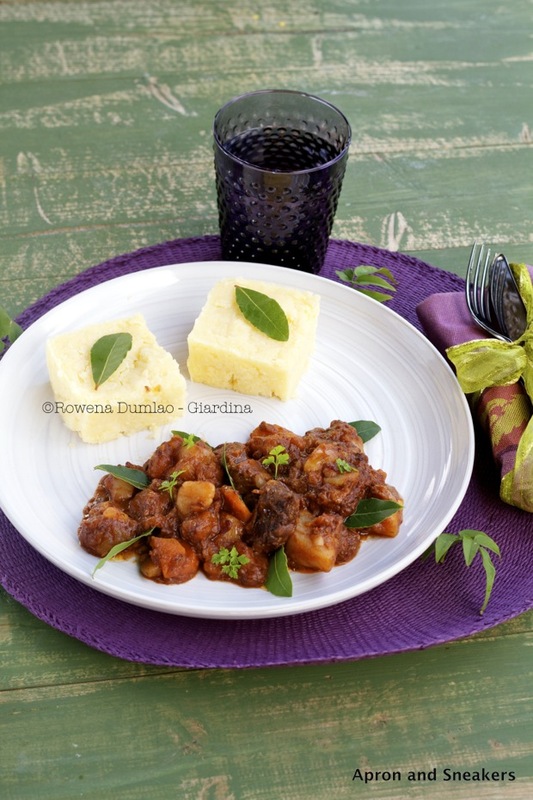 I love beef stews and for so many years I have been experimenting with different kinds of recipes. Not a single one I cooked was the same as the other. They are usually good but my palate keeps on searching for a new one and a better one. 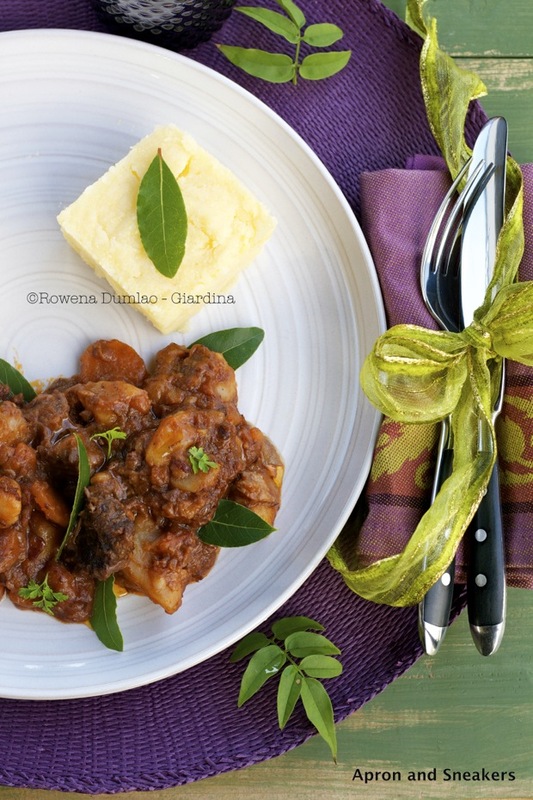 Before Christmas, I decided to cook this beef stew for some friends who were coming over. It was another chance for me to experiment with a recipe. I like using chorizo in my dishes because it adds a powerful flavor. 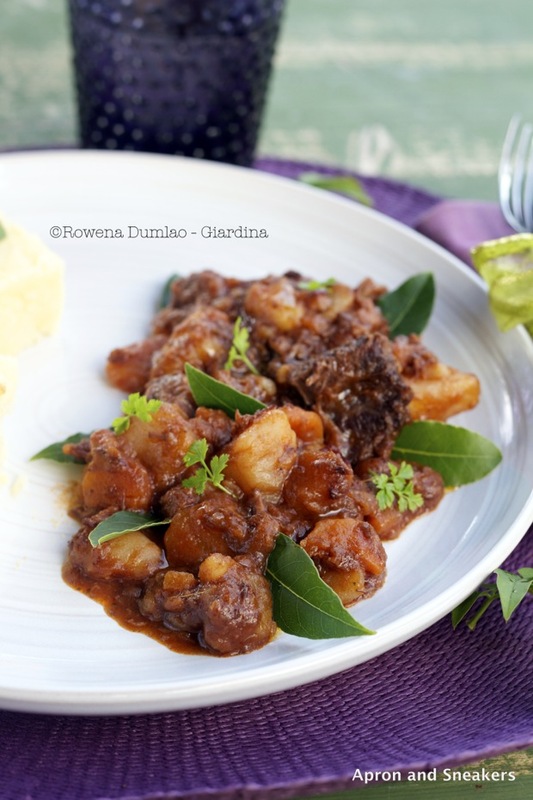 I didn't use chorizo in my beef stew recipes in the past but when I remembered my old Veal Stew with Chorizo and Chickpea recipe, I thought of using it again. Unlike the veal stew, I cooked this one for 3 hours in beef broth and red wine with some tomato concentrate to give it an orange tint. The color is reminiscent of goulash so for that reason, I chose to partner it with polenta. 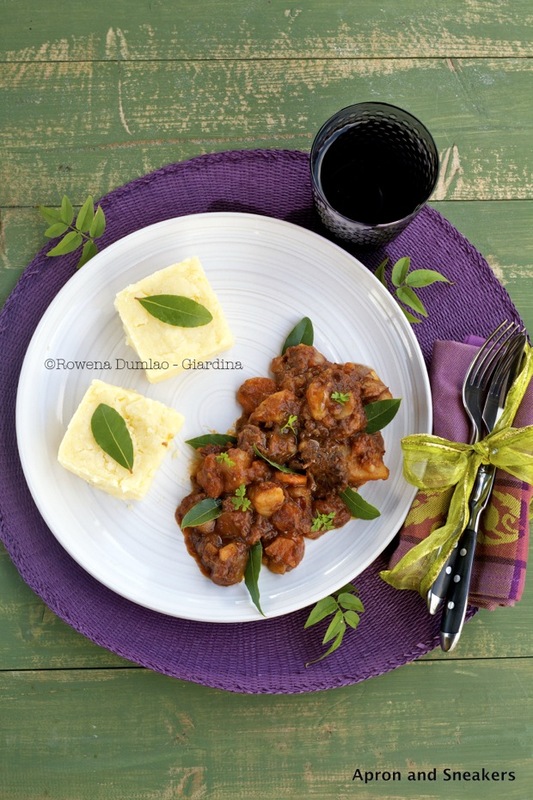 The dish reminds me of my favorite food at the Dolomites, goulash and polenta. Years of trial and error paved way to this recipe. I am going to cook this again this weekend when we have some guests over. Let me see if our second round of guests will like it too like the first ones. Meantime, let me leave you with this recipe. Buon appetito! Sauté the garlic, onion & chorizo in a thick-bottomed large saucepan with extra virgin olive oil. When they are toasted, about 5 minutes, add the meat. Brown all sides. Pour the red wine. Let it evaporate with high flame, about 5 minutes. Add the broth, tomato concentrate, juniper and bay leaves. Cover and simmer for 2 hours in low flame. Add the potatoes and carrots then cook for another 1 hour, covered and in low flame. Note: There are different kinds of polenta. 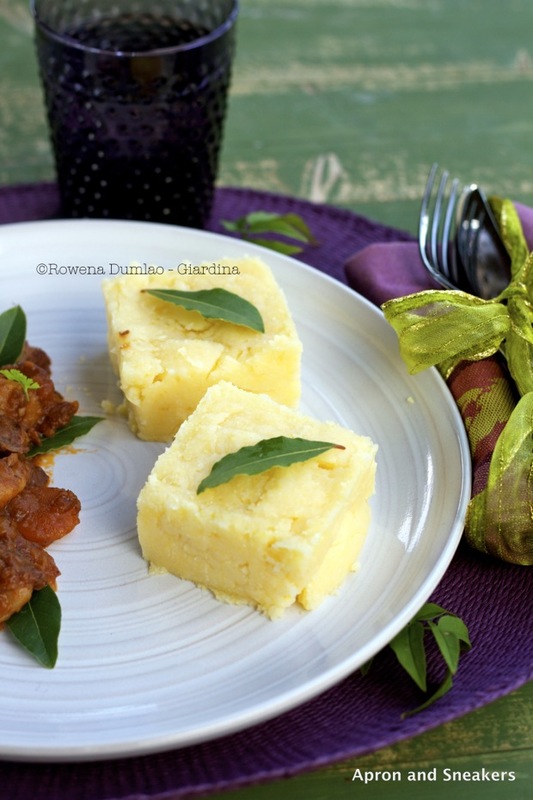 The one I used is farina gialla per polenta (yellow flour for polenta that is not pre-cooked so it takes around 40 minutes or more to cook. The amount of water and salt also differ so please check your packaging on the suggested amount. Prepare the polenta by boiling water in a big pot, preferably copper. When it's just about to boil, add the salt then slowly add the polenta by pouring it slowly in the water. While pouring the polenta, stir with a wooden spoon. Keep on doing this until you finish the polenta. Cook and keep on stirring for 40 minutes or follow the cooking time written in the instructions of the package of the polenta that you are using.